Quattroflow’s quaternary diaphragm pumps offer design and operational advantages for chromatography. Chromatography is the method of choice for processing cell-free and protein-containing supernatants in order to isolate the “target protein” in its highest possible form. It involves passing liquid through a container (axial or radial columns) filled with a matrix that ensures the different contents are properly separated. Therefore, chromatography system builders need pumping technology that has a smooth, reliable and flexible operation. Quattroflow’s positive displacement quaternary pumps have the design and performance characteristics required for chromatography systems. The pumps don’t have any moving parts to provide non-slip operation, which is optimal for transferring shear-sensitive products without damage while virtually eliminating particle generation and heat degradation. 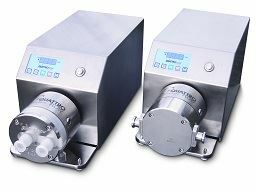 In addition, Quattroflow pumps are self-priming and provide safe dry-run operation and allow for clean-in-place (CIP), sterilize-in-place (SIP) and autoclave capabilities. Other features that make Quattroflow pumps ideal for use in chromatography applications include a flexible, simple control (no stroke adjustment) and easy maintenance. The Quattroflow QF4400HT piston pump can be used in a variety of biopharmaceutical applications.